Dr Elizabeth de Lange has been trained as a chemist, with specialization in Biophysical Chemistry (Groningen University, Groningen, The Netherlands). She obtained her PhD in Pharmacology (Leiden- Academic Center for Drug Research (LACDR), Leiden University, The Netherlands). She got tenure at the LACDR. She currently is Professor on Predictive Pharmacology and the Principal Investigator of the Predictive Pharmacology Group in the Research Division of Systems Biomedicine & Pharmacology of the LACDR. Dr de Lange is concerned with the allocation of resources for the conduct of science towards the goal of best serving the public interest. Also, while she underscores that there is still the need for using animals in drug research, she is concerned about this use, and advocates the use of the Mastermind Research Approach by which knowledge obtained from animals can be condensed and stored in mathematical models. Dr de Lange has a clearly visible and original personal line of research, initially mostly focused on the CNS, but more and more expanding to other tissues and generic pharmacological research questions, which are specified below. She is one of the few in the world that is able to perform and bridge advanced experiments and analytical techniques with mathematical modelling, as a unique approach to build robust mathematictical models for the prediction of drug effects in human, which is the ultimate aim of her research. Specifically, Dr de Lange started groundbreaking work of applying intracerebral microdialysis to the study of drug transport across the blood-brain barrier (BBB), developing new insights in the role of transporters at the BBB and within the CNS, as well as the impact of (disease) conditions on CNS drug distribution. Within the last years, her initial research focus on the CNS has expanded to other body tissues (gut) and fluids (blood clotting), as well as to generic pharmacological problems. Her program focuses on the development of general translational Pharmacokinetic (PK)- Pharmacodynamic (PD) models using advanced in vivo animal experimentation, analytical techniques and mathematical modeling approaches. It involves identification and characterization of the rate and extent of key factors in PK and PKPD relationships and their condition dependency. These key factors involve the kinetics of the drug in plasma; passive and active drug transport into and out of the target tissue; drug distribution within the target tissue; drug equilibration to the target site; and the ability of the drug to interact with the target, in conjunction with biomarkers of the effect. Particular emphasis lies on but is not restricted to the Central Nervous System (CNS), and the role of drug-target interactions in the relationship between dose and effect profiles. This research has a comparative and integrative design to elucidate conditional influences on individual mechanisms. It includes the cycle of simulations – predictions – experimental testing – data modeling– simulations, etc. Experiments typically involve monitoring techniques in (freely moving) chronically instrumented animals, including microdialysis. The microdialysis technique enables to monitor free drug concentrations in a selected tissue, which is an indispensable tool in characterizing rate and extent of passive and active drug dsitribution parameters, and is most valuable to reveal active concentrations at the target site. Moreover, the microdialysis technique can be used to monitor biomarker kinetics. Such techniques are applied in healthy animals, as well as in models of Alzheimer’s disease, Parkinson’s disease and Epilepsy in which disease progression plays a role. The final emphasis is on translation of models to the human situation, and to validate the model predictions by actually observed human (clinical) data. The final emphasis is on translation of models to the human situation, and to validate the model predictions by actually observed human (clinical) data. Fellow Award of the American Association of Pharmaceutical Scientists (2013)- Each year, AAPS elevates a few members to Fellowship in recognition of their professional excellence in fields relevant to AAPS’s mission. Each fellow has demonstrated a sustained level of superior and distinguished professional achievement and contributions in fields related to this mission. Invited honored speaker: Hugh Davson Honorary Memorial Lecture at the British Physiological Society Symposium on “The Blood-Brain Barrier: Mechanisms Regulating Integrity and Transport” on “Application of Intracerebral Microdialysis Studies to Aspects of Blood-Brain Barrier Function”, London, United Kingdom. 1998. TRAIN (Translational Intestinal Models, IWT grant)-. “Systems pharmacology model (QSP) for the prediction of intestinal/colonic drug distribution and efficacy for coxibs targeting colorectal cancer”. IWT O&O project Collaboration Janssen Pharmaceutica, KU Leuven, U Gent. (2017- 2021). “LACDR Scientific Director Grant”- PhD project. “Translational approaches for predicting dopaminergic system functionality in human”. (2013-2017). Mangas V. (PhD Student, Miguel Hernandez University, Valencia, Spain). “Use of microdialysis in unraveling factors in brain distribution of anti-schizophrenia drugs. 2013..
Women in Science- an academics perspective- AAPS Annual meeting. Denver, USA, Nov 2016. Drug-induced changes in metabolomics of plasma, brain extracellular fluid and cerebrospinal fluid. Symposium session “Brain and Body Metabolomics: Probing into the System, Solving the Matrix”. AAPS Annual meeting. Denver, USA, Nov 2016. Indispensable Role of Microdialysis in translational CNS PKPD. Galapagos, Paris, Oct, 2016”. Development of a generic 3d drug distribution brain model. Conference on Complex systems (session Mathematical Pharmacology), Amsterdam. Sept 2016. Pharmacometrics in psychiatry, de Lange, E. In Topical Talks: Talks of interest in the biomedical and life sciences, The Biomedical & Life Sciences Collection, Henry Stewart Talks Ltd, London (online at http://hstalks.com/?t=BL1003696-deLange), May 2015. Prediction of methotrexate CNS distribution in different species – influence of disease conditions, II Congress of the Brazilian Pharmaceutical Sciences Association. Búzios, Brazil, Sept 2014. Modeling & Simulation of brain ECF versus CSF pharmacokinetics for drugs with different PhysChem properties. In Mini‐symposium “Human CSF Concentrations; How Predictive Can We Get?”. 2011 AAPS Annual Meeting and Exposition. Washington DC, USA, Oct 2011. PK/PD relationships of CNS Active Drugs. The Role of BBB Transport. Abbott DMPK Symposium: “Challenges of the Blood Brain Barrier”. Abbott GmbH & Co. KG, Ludwigshafen, Germany, Jun 2010. Mechanism-based PKPD modelling of CNS-active drugs. COST Exploratory Workshop on Pharmacology and Toxicology of the Blood-Brain Barrier: State of the Art, Needs for Future Research and Expected Benefits for the EU. Brussels, Feb 2010. Assessing Novel Applications of Mechanism-and Physiologically-Based Modelling in Drug Development – Techniques and Technological Advancements. Conference on Population PK- PD: Fulfilling its Promise as a Tool to Optimise Clinical Drug Development. London, UK, Sept 2009. Considerations of factors between dose and target site concentrations of CNS active drugs, Ludwig-Maximilians-University Munich, Germany. Jun 2009. Modulation of Blood-Brain Barrier function and GABAA receptor properties in pharmacoresistant epilepsy. Translational Workshop “Basic Scienstists meet Clinicians” at the 10th Annual International Clinical Symposium Kempenhaeghe: “Epilepsy & Sleep Update”. Heerze, the Netherlands. Apr 2008. ABC transporters of Choroid Plexus Epithelial Cells in the Homeostasis of the Cerebrospinal Fluid. The VIIIth European Meeting on Glial Cells in Health and Disease. London, United Kingdom, Sep 2007. Factors between Drug Dosing and CNS Effects; Plasma Pharmacokinetics, Protein Binding, BBB Functionality and CNS Disorders. 7th International Symposium on Signal Transduction in the Blood-Brain Barriers. Potsdam-Sanssouci, Berlin, Germany, Sep 2004. Blood-Brain Barrier Functionality in Neurodegenerative Diseases- Experimental Approaches. Division of Pharmacokinetics and Drug Therapy. Department of Pharmaceutical Biosciences Uppsala University, Sweden, Mar 2004. Therapeutic Considerations in BBB functionality Changes in Brain Diseases. 2nd Endoneuropsychology meeting. Doorwerth, the Netherlands, Jun 2004. 2. van den Brink WJ, Palic S, Köhler I, de Lange ECM*. Access to the CNS: Biomarker Strategies for Dopaminergic Treatments. Pharm Res. 2018 Feb 15;35(3):64. doi: 10.1007/s11095-017-2333-x. 3. Yamamoto Y, Välitalo PA, Wong YC, Huntjens DR, Proost JH, Vermeulen A, Krauwinkel W, Beukers MW, van den Berg DJ, Hartman RH, Wong YC, Danhof M, Kokkif H, Kokkif M, Meindert Danhof M, van Hasselt JGC, de Lange ECM*. Prediction of human CNS pharmacokinetics using a physiologically-based pharmacokinetic modeling approach. Eur J Pharm Sci. 2018 Jan 15;112:168-179. doi: 10.1016/j.ejps.2017.11.011. Epub 2017 Nov 11. 4. Wong YC, Ilkova T, van Wijk RC, Robin Hartman R, de Lange ECM*. Development of a population pharmacokinetic model to predict brain distribution and dopamine D2 receptor occupancy of raclopride in non-anesthetized rat. Eur J Pharm Sci. 2018 Jan 1;111:514-525. doi: 10.1016/j.ejps.2017.10.031. Epub 2017 Nov 5. 5. Vlot AHC, Witte WEA, Danhof M, van der Graaf PH, van Westen GJP, de Lange ECM*. Target and tissue selectivity prediction by integrated mechanistic pharmacokinetic-target binding and quantitative structure activity modelling AAPSJ. 2017 Dec 4;20(1):11. doi: 10.1208/s12248-017-0172-7. 8. Xiaomei Chen, Tim Slättengren, Elizabeth C.M. de Lange, David E. Smith, Margareta Hammarlund-Udenaes. Revisiting Atenolol as a Low Passive Permeability Marker Fluids Barriers CNS. 2017 Oct 31;14(1):30. doi: 10.1186/s12987-017-0078-x. 9. De Lange ECM*, van der Brink W, Yamamoto Y, de Witte W, Wong YC. Novel CNS drug discovery and development approach: model-based integration to predict neuro-pharmacokinetics and pharmacodynamics. Expert Opin Drug Discov. 2017 Dec;12(12):1207-1218. doi: 10.1080/17460441.2017.1380623. Epub 2017 Sep 21. 11. Nederpelt I, Kuzikov M, de Witte WEA, Schnider P, Tuijt B, Gul S, IJzerman AP, de Lange ECM, Heitman LH. From receptor binding kinetics to signal transduction; a missing link in predicting in vivo drug-action. Sci Rep. 2017 Oct 26;7(1):14169. doi: 10.1038/s41598-017-14257-4. 19. Schuetz DA, de Witte WEA, Wong YC, Knasmueller B, Richter L, Kokh DB, Sadiq SK, Bosma R, Nederpelt I, Heitman LH, Segala E, Amaral M, Guo D, Andres D, Georgi V, Stoddart LA, Hill S, Cooke RM, De Graaf C, Leurs R, Frech M, Wade RC, de Lange ECM, IJzerman AP, Müller-Fahrnow A, Ecker GF. Kinetics for Drug Discovery – An industry driven effort to target drug residence time. Drug Discov Today. 2017 Jun;22(6):896-911. doi: 10.1016/j.drudis.2017.02.002. Epub 2017 Apr 13. 25. Taneja A, Vermeulen A, Huntjens DR, Danhof M, De Lange EC, Proost JH. Summary data of potency and parameter information from semi-mechanistic PKPD modeling of prolactin release following administration of the dopamine D2 receptor antagonists risperidone, paliperidone and remoxipride in rats. Data Brief. 2016 Aug 6;8:1433-7. doi: 10.1016/j.dib.2016.07.060. 27. Taneja A, Vermeulen A, Huntjens D, Danhof M, De Lange EC, Proost JH. A comparison of two semi-mechanistic models for prolactin release and prediction of receptor occupancy following administration of dopamine D2 antagonists in rats. Eur J Pharmacol. 2016 Oct 15;789:202-14. doi: 10.1016/j.ejphar.2016.07.005. 32. Vendel E, de Lange EC* Functions of the CB1 and CB 2 receptors in neuroprotection at the level of the blood-brain barrier. Neuromolecular Med. 2014 Sep;16(3):620-42. doi: 10.1007/s12017-014-8314-x. Epub 2014 Jun 15. 33. Kervezee L, Hartman R, van den Berg DJ, Shimizu S, Emoto-Yamamoto Y, Meijer JH*, de Lange EC*. Diurnal variation in P-glycoprotein-mediated transport and cerebrospinal fluid turnover in the brain. AAPS J. 2014 Sep;16(5):1029-37. doi: 10.1208/s12248-014-9625-4. Epub 2014 Jun 11. 34. Bogdanović RM, Syvänen S, Michler C, Russmann V, Eriksson J, Windhorst AD, Lammertsma AA, de Lange EC, Voskuyl RA, Potschka H. (R)-[11C]PK11195 brain uptake as a biomarker of inflammation and antiepileptic drug resistance: evaluation in a rat epilepsy model.Neuropharmacology. 2014 Oct;85:104-12. 35. Westerhout J, van den Berg DJ, Hartman R, Danhof M, de Lange EC*. Prediction of methotrexate CNS distribution in different species – influence of disease conditions. Eur J Pharm Sci. 2014 Jun 16;57:11-24. 36. Rip J; Chen L; Hartman R; van den Heuvel A, Reijerkerk A; van Kregten J; van der Boom B; Appeldoorn CCM; de Boer M; Maussang D; de Lange ECM; Gaillard PJ. Glutathione PEGylated liposomes; pharmacokinetics and delivery of cargo across the blood-brain barrier in rats. J Drug Target. 2014 Jun;22(5):460-7. 37. Syvänen S, Russmann V, Verbeek J, Eriksson J, Labots M, Zellinger C, Seeger N, Schuit R, Rongen M, van Kooij R, Windhorst AD, Lammertsma AA, de Lange EC, Voskuyl RA, Koepp M, Potschka H. [11C]quinidine and [11C]laniquidar PET imaging in a chronic rodent epilepsy model: Impact of epilepsy and drug-responsiveness. Nucl Med Biol. 2013 Aug;40(6):764-75. 40. De Lange ECM*. Utility of cerebrospinal fluid in translational neuroscience. In: Special Issue “Translational Modeling In Neuroscience”. Editor P Bonate. J Pharmacokinet Pharmacodyn. 2013 June; 40(3): 315-326. 42. De Lange ECM*. The mastermind approach to CNS drug therapy: translational prediction of human brain distribution, target site kinetics, and therapeutic effects. Fluids and Barriers of the CNS 2013, 10:12. 43. Taneja A, Nyberg J, de Lange EC, Danhof M, Della Pasqua O. Application of ED-optimality to screening experiments for analgesic compounds in an experimental model of neuropathic pain. J Pharmacokinet Pharmacodyn. 2012 Dec; 39(6): 673-81. 60. Kooij G, van Horssen J, de Lange EC, Reijerkerk A, van der Pol SM, van Het Hof B, Drexhage J, Vennegoor A, Killestein J, Scheffer G, Oerlemans R, Scheper R, van der Valk P, Dijkstra CD, de Vries HE.T lymphocytes impair P-glycoprotein function during neuroinflammation. J Autoimmun. 2010 Jun;34(4):416-25. 64. Groenendaal D, Freijer J, Rosier A, de Mik D, Nicholls G, Hersey A, Ayrton A, Danhof M and De Lange EC*. Pharmacokinetic-Pharmacodynamic Modeling of the EEG effects of Opioids: Role of Complex Biophase Distribution Kinetics. Eur J Pharm Sci, 34; 149-163, 2008. 92. De Lange ECM*, Danhof M, De Boer AG and Breimer DD: Methodological Considerations of Intracerebral Microdialysis in Pharmacokinetic Studies on Blood-Brain Barrier Transport of Drugs. Brain Res Revs, 25; 27-49, 1997. 11. De Boer AG, De Lange ECM, Van der Sandt ICJ, Breimer DD. The Application of Microdialysis Techniques to the Study of Drug Transport across the Blood-Brain Barrier. 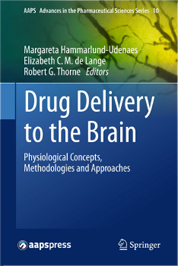 In: The Blood-Brain Barrier and Drug Delivery to the CNS”. Eds: Begley DJ, Bradbury MW, Kreuter J, 2000. PSWC Young Scientist Satellite Congress in Uppsala, Sweden, May 2017, Advisor. Honorary Symposium to M Danhof “Four Decades of Research in Pharmacokinetics and Pharmacodynamics, and beyond”. Leiden, May 2017, Organizer. 10th International Conference on Cerebral Vascular Biology, June 2015, Paris, France. Scientific Committee member. 7th Noordwijkerhout Symposium on Pharmacokinetics, Pharmacodynamics and Systems Pharmacology- Noordwijkerhout, NL, May 2014, Scientific Committee member. 9 th International Conference on Cerebral Vascular Biology, June 2011, Leiden, the Netherlands- Chair of the organizing Committee. Translational Workshop “Basic Scienstists meet Clinicians” at the 10 th Annual International Clinical Symposium Kempenhaeghe: “Epilepsy & Sleep Update”. Heerze, the Netherlands. Apr 2008. Discussion leader. 11th International Symposium on Signal transduction in the Blood-Brain Barriers, Amsterdam, the Netherlands, Sep 2008. Organizing Committee Member. Course on “Theoretical and Practical Aspects of Quantitative Microdialysis; the MetaQuant Probe II”. Brains On-Line, Groningen, the Netherlands, Jan 2008. Organizer and Lecturer. PK-PD Course. Solvay Pharmaceuticals, Weesp, The Netherlands, Dec 2008. Organizer and Lecturer. Course on “Theoretical and Practical Aspects of Quantitative Microdialysis; the MetaQuant Probe I”. Brains On-Line, Groningen, the Netherlands. Sep 2007. Organizer and Speaker. Course “Methods in Studies of Drug Delivery to the Brain” ULLA Summerschool, Leiden, the Netherlands, Jul 2007. Co-organizer and Lecturer. Workshop “AAPS Microdialysis Workshop; Application and Regulatory Perspectives”, Nashville, TN, United States of America. Nov 2005. Scientific Committee Member and Speaker. Course “Methods in Studies of Drug Delivery to the Brain”. ULLA Summerschool, Uppsala, Sweden, Jun 2005. Co- Director and Lecturer. Course “Drug Transport into the Brain, Basic Aspects and Therapeutic Implications”, ULLA Summerschool Uppsala, Sweden, Jun 2005. Lecturer. Symposium Session on “Biomarkers in Drug Development”, and presentation on “Biomarkers and Mechanism-Based Pharmacokinetic-Pharmacodynamic Modelling; a Perfect Symbiosis”. EUFEPS PharmSciFaire, Nice, France, Jun 2005. Co-Chair and Speaker. Course on “Basic and Advanced Aspects of Microdialysis” preceding the 4th International Symposium on Microdialysis in Drug Research and Development. Vienna, Austria, Jun, 2004. Presentation: “Troubleshooting in Microdialysis”. Lecturer. 4th International Symposium on Microdialysis in Drug Research and Development. Vienna, Austria, Jun 2004. Scientific Committee Member and Speaker. 3th Dutch Endoneuromeeting Session “The Blood-Brain Barrier in Neurological Diseases”. Doorwerth, the Netherlands, Jun 2004. Co-organizer and Speaker. 2nd Dutch Endoneuromeeting: session “The Blood-Brain Barrier”. Doorwerth, the Netherlands, Jun 2003. Co-Organizer. Research Course on “Microdialysis in Drug Development”. Uppsala, Sweden, Mar 2003. Co- course Director and Lecturer. Course on “Basic and Advanced Aspects of Microdialysis” preceding the 3rd International Symposium on Microdialysis in Drug Research and Development. Minneapolis, United States of America, Jun 2002. “Troubleshooting in Microdialysis” Lecturer. 3rd International Symposium on Microdialysis in Drug Research and Development. Minneapolis, United States of America, Jun 2002. Scientific Committee Member. Course on “Microdialysis in Pharmaceutical Research”, ULLA Summerschool, London, UK, Jul 2001. Co-Director and Lecturer. Course on “Microdialysis and Sensoring”. Lecture on “Application of quantitative microdialysis in preclinical studies”, Academic Hospital, Groningen, the Netherlands, Dec 2001. Lecturer. Course on “Basic and Advanced Aspects of Microdialysis” Preceding the 1st International Symposium on microdialysis in drug research and development. Noordwijkerhout, the Netherlands, Apr 1998. Co-organizer and Speaker. Course on “Drug Transport into the Brain, Basic Aspects and Therapeutic Implications”. Lecture on: “In Vivo Systems to Study Drug Transport to the Brain”. ULLA Summerschool, Leiden, the Netherlands. Jul 1997. Lecturer. Course on “Microdialysis in Pharmaceutical Research”. ULLA Summerschool, Leiden, the Netherlands. Jul 1997. Co-director and Lecturer.